This ritual is opposed even by the multi-culturally sensitive Canadian Veterinary Association who opposes Halal slaughter because it is scientifically proven that animals slaughtered without first being stunned, causes preventable pain to the animal. It is also banned in countries that are otherwise bastions of tolerance like Norway and Sweden, because it is proven cruel treatment of animals. Given the growing prominence of this Halal issue, one might think Muslims are a huge population in Canada. 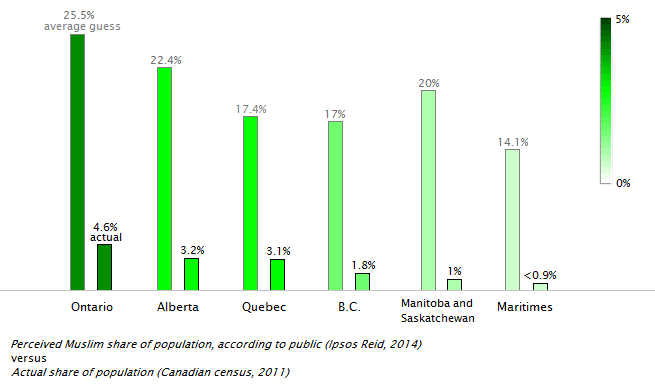 However, based on Stats Canada stats, Muslims only represent about 3.2% of our population. This article documents the misperception of Canadians as to the percentage of Muslims in Canada. Most Canadians way over estimate the percentage of Muslims in Canada as being 20% of the population, when in reality it is 3.2%. Also, if Muslims only represent about 3.2% of Canada’s population, how is it that a Halal meat company like Paramount is doing so exceedingly well financially? Is Halal slaughtered meat sometimes sold as regular meat to unsuspecting consumers? Yes, say many investigating Halal. 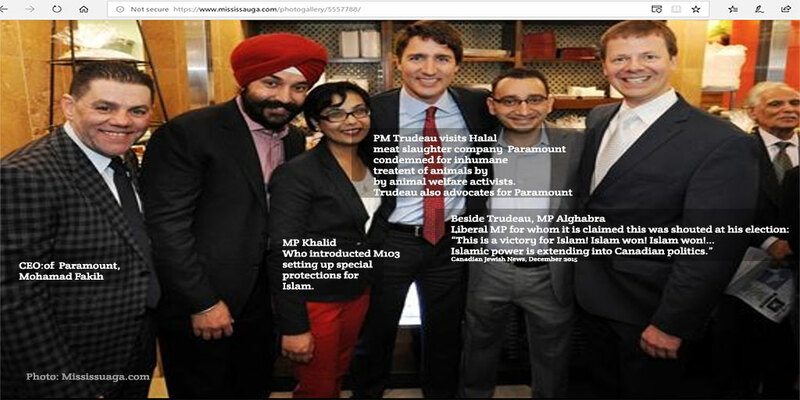 Opposite is also a photo of PM Trudeau with the CEO of Paramount, along with two Muslim MPs including MP Khalid who passed a motion highlighting special protections for Islam over other religions. Online investigative articles reveal that in the UK for example, Halal meat ends up in grocery stores without the Halal label. 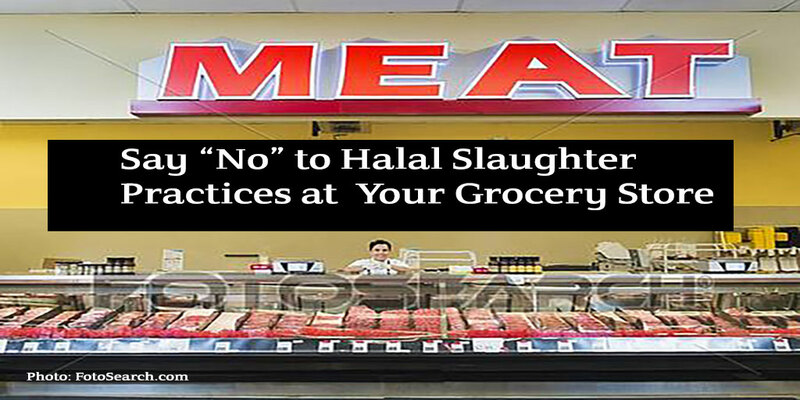 Therefore, unsuspecting customers, who are not Islamic, end up buying and eating meat that has not been treated in the humane methods we trust our grocery stores to provide; and, it is meat which has had a Sharia Islamic prayer said over it. Halal slaughter based companies like Paramount are making financial gains because non-Islamic consumers are buying and eating Halal meat based on false advertising that it’s a humane pure choice; or, without knowing it is Halal. Canadians that are in areas where there are a lot of Halal meat processing plants, for example, Edmonton, or shop at large volume stores like Costco, and who do not want to buy Halal meat for reasons of the humane treatment of animals and/or faith: speak up at the grocery stores and make sure Halal meat is not being sold in the regular meat counters. The humane treatment of animals is part of our Canadian identity and we have a duty to speak up. This entry was posted in Halal Islamic Sharia Law, Politics, Canada, Think Over News and tagged animals, cow slaughter methods, is halal humane, islam, law, meat processing, Sharia, what is halal.